Dog – Boating – Power! We may be small but we love boating aboard our powerboat – here at Trawler Fest in Cap Sante Marina enjoying the food, smells, sights and boating activities. 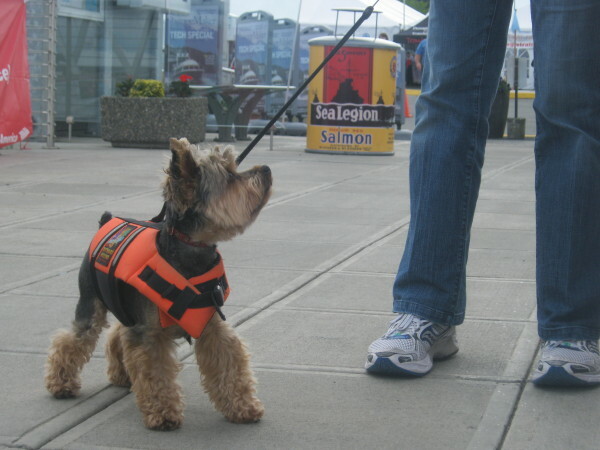 My sister wears a yellow life jacket and I like my orange life jacket – I am a happy pup on the boat with mom and dad! Previous postTeddy Do - Sailing Happy Dog, San Juan Island - Fun Loving Dog! Next postF/V Natalie Gail - SE AK Seiner, Captain Hollis new lil black dog with fast friend 90 lb Gracy who loves to swim!